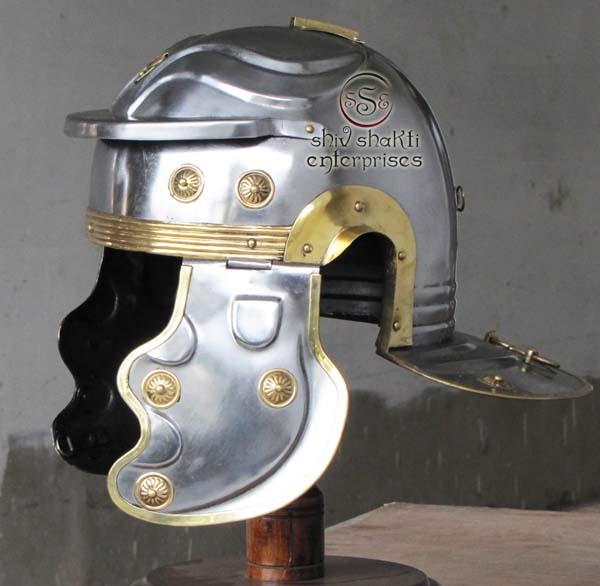 This Roman Helmet is handmade from 18 gauge steel with brass accents. 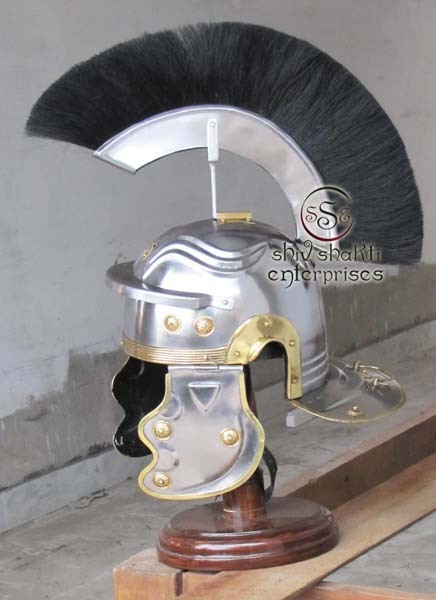 The black & white hair plume offers a gallant accent to this stunning replica. Style and size may vary slightly. 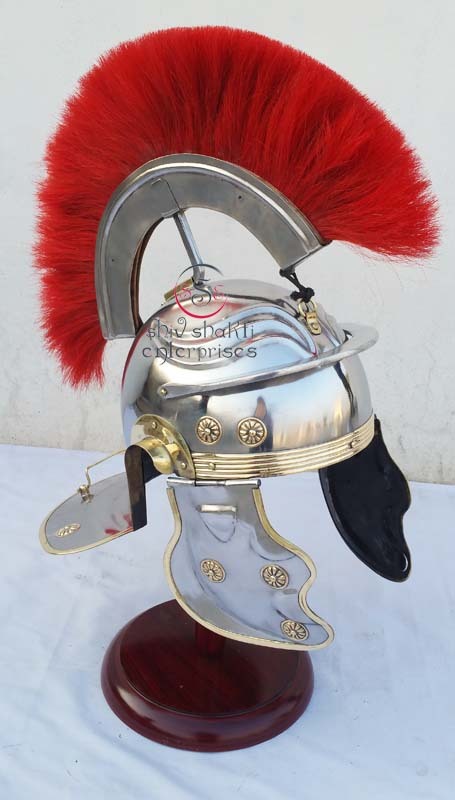 This Roman helmet is full sized and wearable for costume purposes. 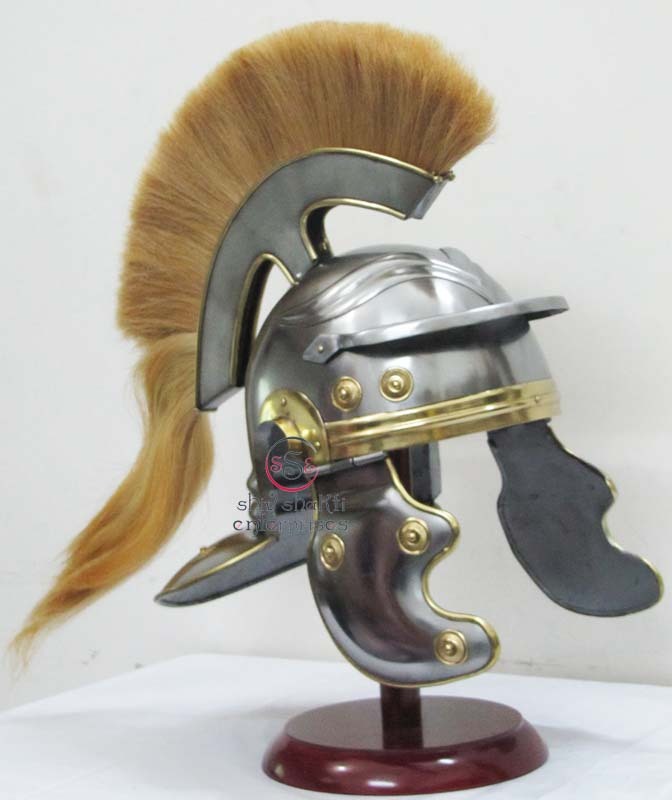 It will make a great Roman history display piece. 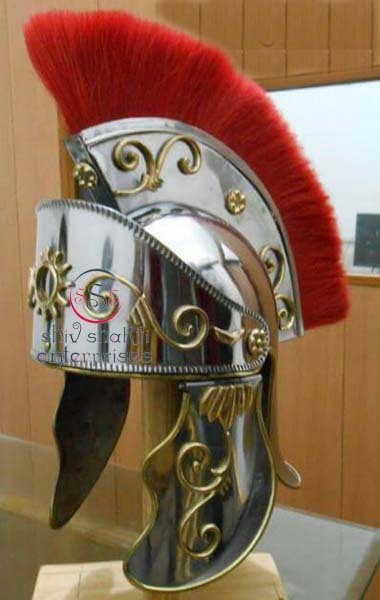 Roman centurion used to be equivalent to Captain in Roman Army. He used to gain this high esteem position. 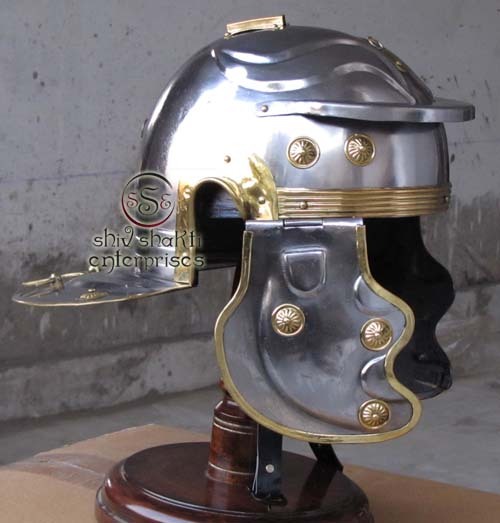 ﻿This Roman Helmet is handmade from 18 gauge steel with brass accents. 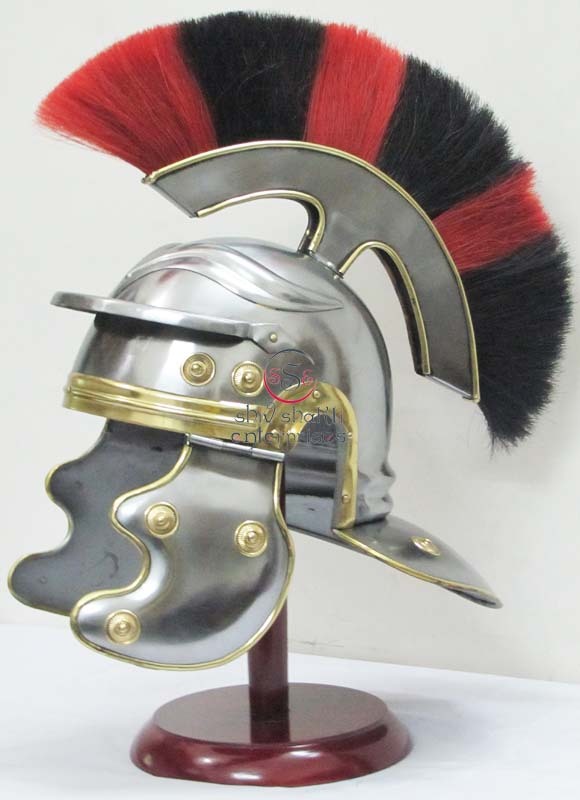 The red hair plume offers. 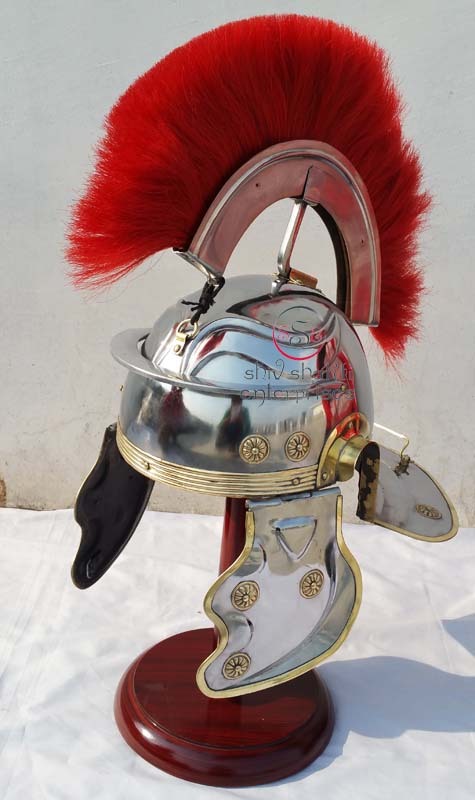 This Roman helmet is full sized and wearable for costume purposes. 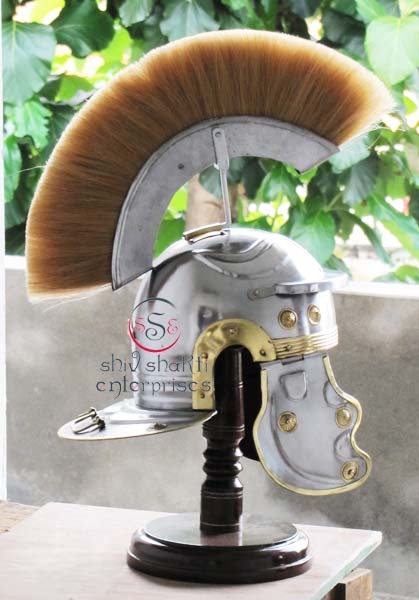 It will make a great Roman history display piece. 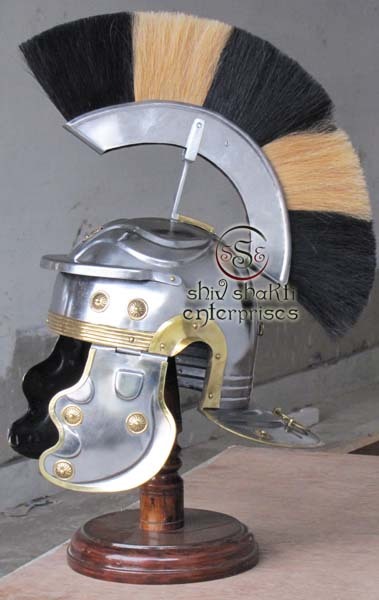 These battle helmets are crafted of heavy 18 gauge steel construction. 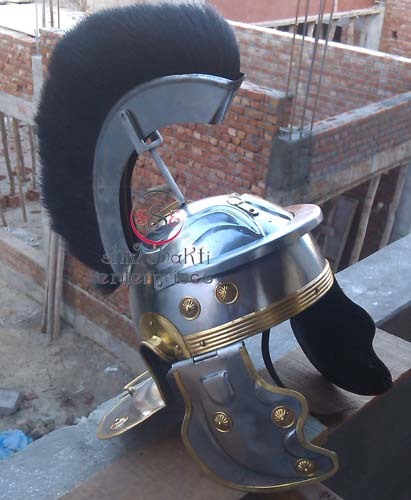 They are designed after Roman helmets and are hand-made and wearable. 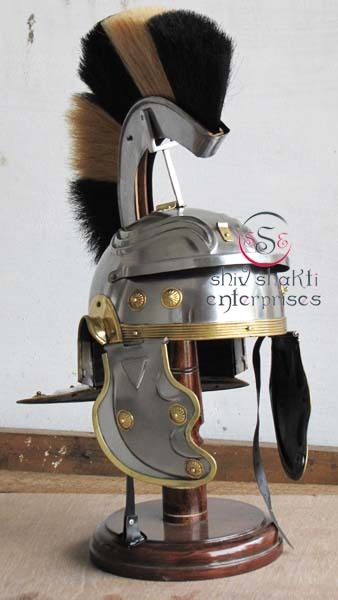 This helmet is not lined and may fit more comfortably with an Ineer Cap. The brow guard fully adjustable. 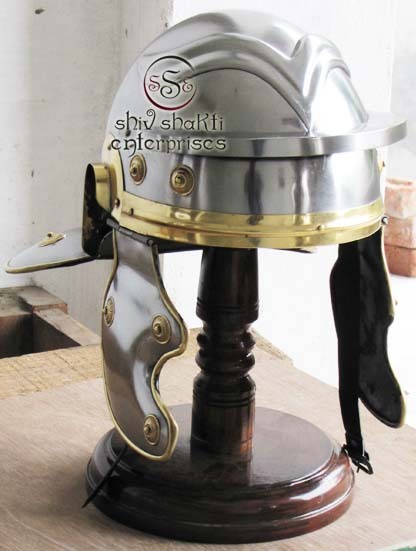 The neck guard is adorned with two embossed brass rivets. 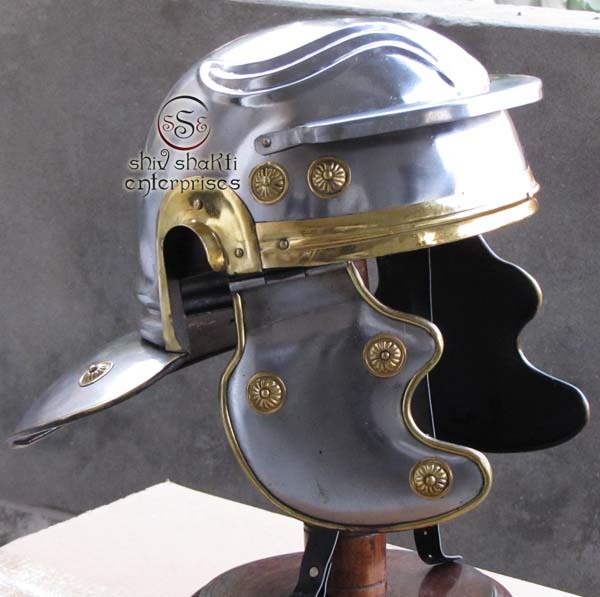 The cheek guards are on hinges to give you a comfortable fit. All work is hand made. 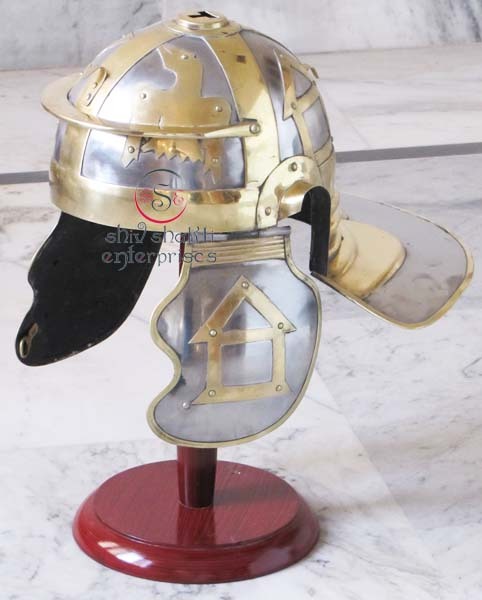 The famous Roman helmet back to front. 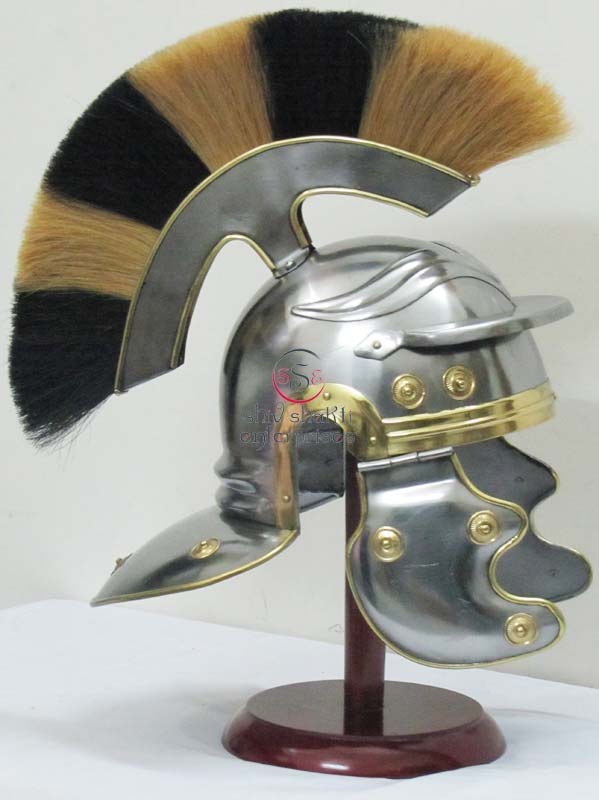 It is made in 18 gauge polished steel. 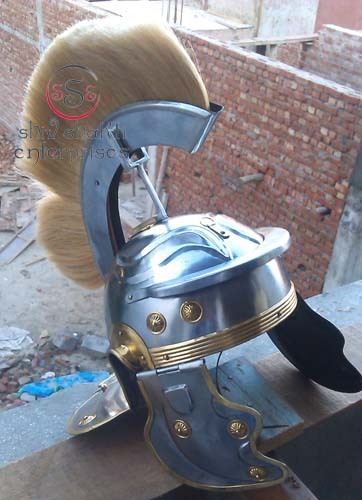 This wearable warrior Roman helmet is 18 inches high.﻿﻿ The neck guard is adorned with two embossed brass rivets. 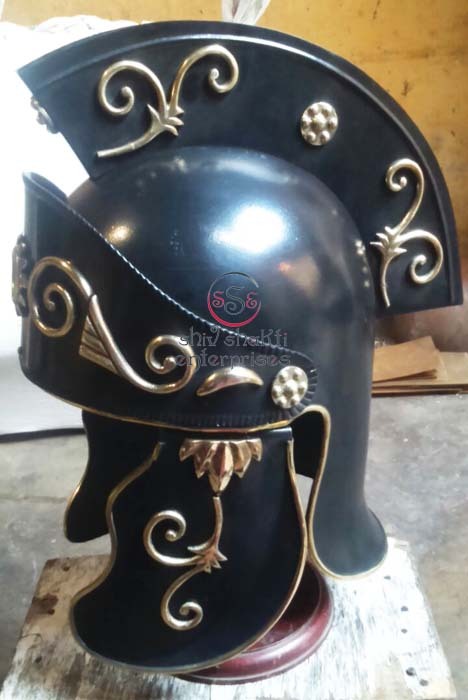 We make helmets in polish finish as well as in antique finish as per you requirement.﻿ The famous Roman helmet comes with the red plume from back to front. 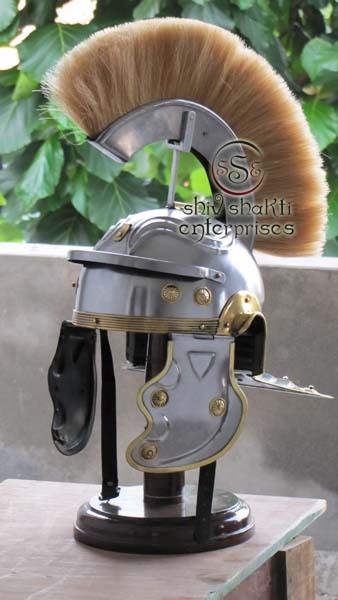 It is made in 18 gauge polished steel. 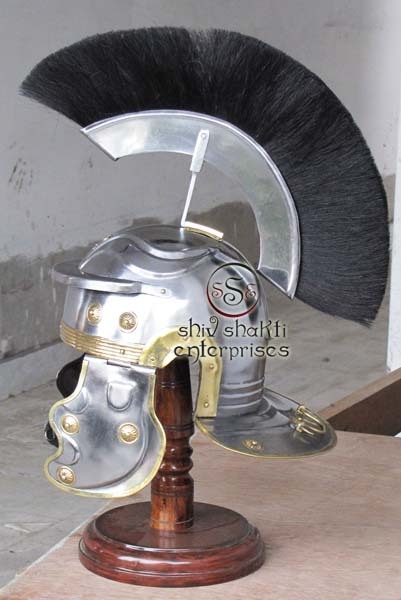 This wearable military Roman helmet is 18 inches high.